My sliding panel example consists of 9 separate panels. I set both the height and width of each panel to 500px. Whilst only one panel is visible at any one time, the panels are actually laid out in a grid pattern. 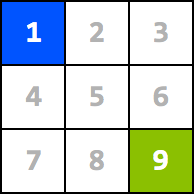 Setting the width of the .SlidingPanelsContentGroup selector to the width of the .SlidingPanels selector (500px) creates a grid containing 1 column and 9 rows. In this instance the panels will slide vertically. Setting the width of the .SlidingPanelsContentGroup selector to a value greater than or equal to the total width of all panels (4500px) creates a grid containing 9 columns and 1 row. Now the panels will slide horizontally. The trick to getting panels to slide in any direction is to create a grid containing both multiple rows and multiple columns. To do this set the width of the .SlidingPanelsContentGroup selector to a value greater than the width of the .SlidingPanels selector (500px) but less than or equal to the total width of all panels (4500px). Importantly, this value should also be a multiple of the width of the .SlidingPanels selector. In my example this would be either 1000px, 1500px, 2000px, 2500px, 3000px, 3500px or 4000px. Let’s assume the the current panel is panel 1. To use a spreadsheet analogy I’ll call this position r1c1. If I navigate to say panel 7 (r3c1) the panels will slide vertically as panel 7 is in a different row (r3) but in the same column (c1). 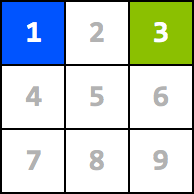 If panel 1 (r1c1) is the current panel and I navigate to panel 3 (r1c3) the panels will slide horizontally as panel 3 is on the same row (r1) but in a different column (c3). 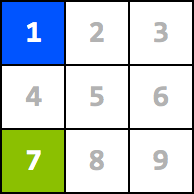 If panel 1 (r1c1) is the current panel and I navigate to panel 9 (r3c3) the panels will slide diagonally from left to right as panel 9 is in both a different row (r3) and column (c3). Reading over this post it occurred to me that for many of you this is probably a no-brainer. While Adobe’s examples are good there’s no real explanation of the mechanics of sliding panels. Consequently, it can be difficult to adapt their examples for your own needs. So, maybe those in a similar situation to me will find this post helpful. I have had some success with sliding panels – but I do have one issue. On panels with widths less than or more than a multiple of 100 (ie 770 or 96 or 251) the sliding panels seem to have a strange random pixel gap every now and then. I tried your example in Firefox and Safari on a Mac running Snow Leopard (10.6.2). However, I can't seem to reproduce the issue you're having. I'd be interested to know what you see with my latest example.